I recently found a vintage spice rack with six bottles still wrapped in plastic. I did my normal treatment of sanding, coating the edges of the piece with candle wax, three coats of white chalk paint, sanding again, and a coat of satin varnish. I think the little wooden rack turned out nicely and will look great in someone's kitchen holding their most used spices. But this post isn't about using a spice rack to hold spices. It's about using a spice rack for OTHER things. I love finding uses for things other than their intended purpose. It's fun to spend some time thinking outside the box about what to do with items that you find at sales or even items you no longer need at your home (that way the piece is free!). There are so many small things in a house to store, I thought I'd give you some more ideas of what to do with empty spice bottles that you might have lying around. There are so many tiny things that need stored in a craft space. 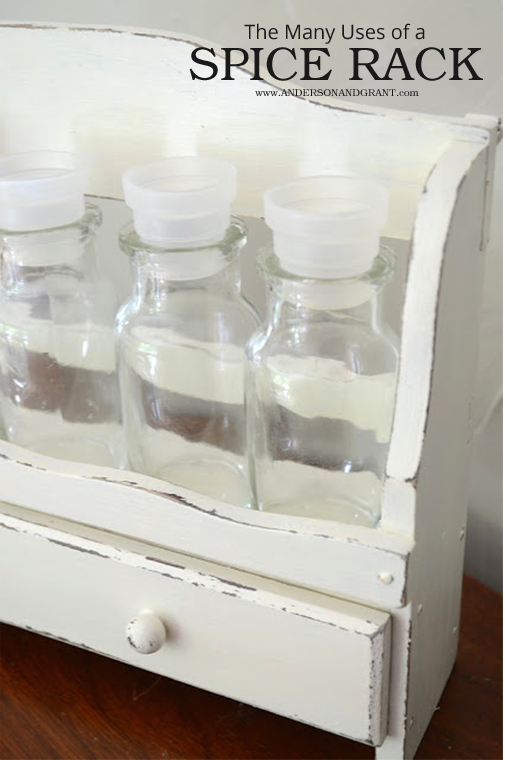 The bottles can be filled with necessities like pins, extra bobbins, and safety pins and could sit on a counter near your sewing machine. They'd also work well for storing beads or buttons. And wouldn't these bottles look decorative and be functional holding something like glass glitter? Rubber bands, paper clips, binder clips and push pins....any of those tiny things you might need while working at your desk could all be stored neatly in these jars. Plus, the drawers underneath could hold other small items...stamps, maybe? For the DIY-er, I think this spice rack could be a decorative place to hold commonly needed screws, nails, and other tiny objects needed in the DIY process....Who doesn't want a decorative workshop?!?! Wouldn't these look great displaying some fresh cut flowers in water? The jars don't just have to hold spices in the kitchen....If you do a lot of baking, sprinkles could fill the jars instead. At the end of the season, there are plants like black-eyed Susan's that have seeds that can be collected for the next year. If you have a nice potting shed or space in your garage to be decorative, the spice rack could be used to store seeds. If all else fails, you could always use the spice jars for the intended purpose of ..... storing spices! Is there anything else you can think of to use this product for?